An undiscovered beach in the south of Spain! Only nine kilometres from Vejer, between Cape Roche and Cape Trafalgar, lies one of the most spectacular beaches of the Andalusian coast – El Palmar. 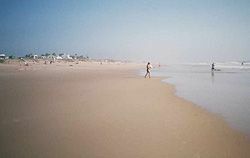 The beach of fine golden sand is more than four kilometres long and an average of 50 metres wide. In summer it is one Vejer’s main attractions. To get to El Palmar take the 2131 at the junction with the N340 – the same junction which gives access to the road leading up to Vejer. At the second junction, turn right, and from here you can see the fields of palmitos which have given El Palmar its name.